Lily bulb size varies greatly depending on the bulb type (Asiatic, Trumpet, Oriental, or species), age, whether from seed or scale, where grown (i.e. soil and climatic differences), and breeding background. Different species have different characteristics - some are slender "dog-bone" shapes, and others are elongated, or round. All lilies make larger bulbs when left undisturbed, or will divide into several, smaller-sized ones after a couple of years. Any bulb which blooms is mature; if it's ten inches or three inches in circumference, the facts of reproductive life remain the same. 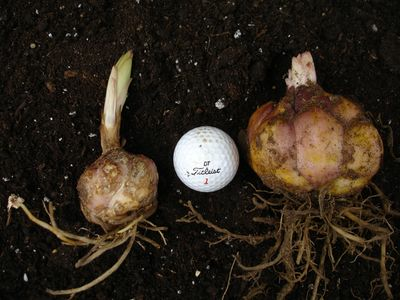 Cool summers tend to produce smaller-sized, mature bulbs. Should we feel a variety is not minimum size upon harvest, we replant for another season's growth, but sometimes we too make errors; if a hybrid variety doesn't bloom the first summer after planting, we would like to hear from you by early September. Larger bulbs tend to produce more flowers, but only if normal for that variety. Some lilies have a low bud count for the relative size of the bulb, yet others can produce a smaller, mature bulb and have three dozen or more blooms, especially in the case of Asiatics. Occasionally, we may send an Exhibition-size� bulb in your order, at no extra cost to you; the package may, or may not, be marked as such. Please do not think that a vary large bulb is a sign that the others are too small � it means that we have dipped into our propagation stock to honor all requests for a variety. Only bulbs grown for cut flower production in Holland have been pre-graded to be the same size (usually smaller than we send), our bulbs are sent as nature provided on our farm.